The classic side of fries, something we all grew up enjoying whether we added them with our wings or burgers or just had them on their own and made them a sort of meal to enjoy to ourselves. The only thing I would change from then and now is to avoid the deep frying, as you get older, you start looking at certain things to avoid but baking the fries, keeps a classic favourite on the menu. 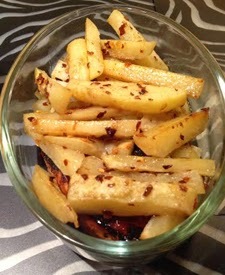 Creating your own homemade fries is one of the easier meals you can make, you can add any spice that you enjoy to the fries and just have to make sure you cook the potato to a proper temperature. I enjoy adding some spice to just about anything and that doesn't change with my fries. This classic is made to taste and makes ketchup an unneeded necessity with this dish but for those that love to dip their fries in ketchup, dip away. 1- Preheat oven to 400F. 2- Prepare potatoes by cutting off ends, then cut in half lengthwise and then cut into wedges with no skin. 3- In a large bowl mix together all other ingredients. 4- Drench each wedge into mixture and place individually on a large baking sheet lined with foil and sprayed with cooking spray. 5- Spoon any additional mixture over potatoes.